First exalted as the perfect socialist city, then suffering decline in the post-Communist era, Nowa Huta has been Krakow’s poor relative for decades. Now, an agreement between Krakow’s mayor, Jacek Majchrowski, and the Marshall of Małopolska, Marek Sowa, may be the first hopeful step on a stairway to economic heaven for the district. 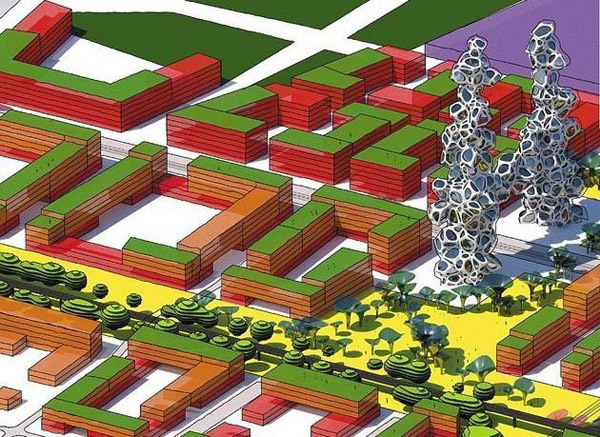 The plan, which Majchrowski called: “A new chapter in the city’s history,” calls for the redevelopment of a 5,500-hectare area stretching from ul. Bulwarowa and ul. Klasztorna eastward to the city limits, with ul. Igolomska as the main artery. 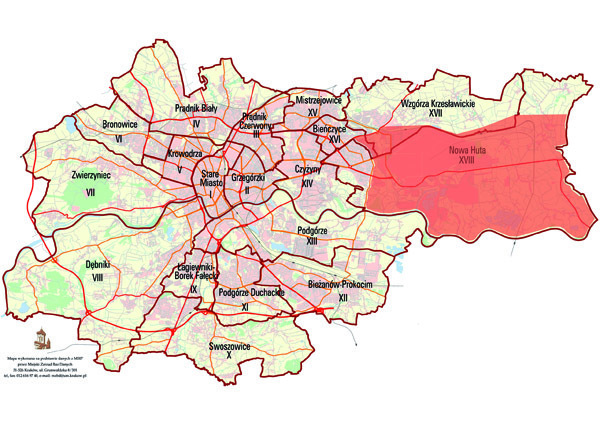 This area lies to the east of the main concentration of housing estates that make up Nowa Huta and includes the vast steel mill that gave the district its name. It represents about 15 percent of the total area of the city. 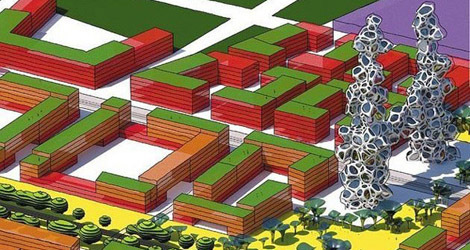 The first stage and ‘fly wheel’ of the concept is to be the establishment of a state-of-the-art research and development centre called the Branice Technology Park (a sub-sector of the Krakow Technology Park Special Economic Zone). It is hoped that some metallurgy-related businesses, as well as academic institutions and local government departments will be the first to set up shop in the park. This should create jobs in the area and encourage private investors to build residential developments and recreation areas. Also within the redevelopment area are several large lakes near the village of Przylasek Rusiecki, which will become part of a 37-hectare Large-Scale Open Space Cultural Events Centre. Already being referred to as a new Błonia, the Cultural Events Centre will have multiple sports facilities and it is also hoped that the hot springs in Przylasek Rusiecki can be used to construct geothermally-heated pools. The vision of a developed eastern fringe of Krakow has been around for some time now. Last year, local authorities held the Krakow – Nowa Huta Of The Future architectural contest, which was won by Gliwice-based firm, ARAC Office of Urban Planning and Architectural Design. The scope of the competition was one of the largest in Polish history, in terms of both area and projected spending. The 450,000 zł prize money for the Nowa Huta Of The Future competition was put up by ArcelorMittal Poland, the company that now owns the Tadeusz Sendzimir Steelworks and is by far the biggest corporation operating in the district. “In recent years the steelworks have changed significantly. We have torn down the old and non-ecological industrial installations, releasing areas that can be re-used for future development,” said ArcelorMittal Poland spokesperson, Sylwia Winiarek. Estimates put the total cost of the redevelopment plans at 4 billion zł. The first 4 million zł is to come from the city and regional authorities, but the rest will have to come from EU subsidies over the period 2014 to 2020. This will depend on local government and private investors winning these funds for specific projects. “We will be presenting at the most important business events and fairs to promote our idea and attract the big players,” said Marek Sowa. There is a long road ahead for Nowa Huta. In order to attract private investors, Krakow’s authorities face the huge and complex task of merging fragmented building plots and putting the necessary infrastructure in place, particularly the upgrading of ul. Igolomska. Also of vital importance will be the completion of the S7 expressway, which will sweep around the eastern edge of the city and provide the main access to the development zone via a junction with ul. Igolomska. Krzysztof Krzysztofiak, vice-chairman of the Krakow Technology Park, speaks warmly of the project, though he advises patience. “Krakow now faces an enormous amount of planning and conceptual work – attracting investors will be a task that will take many years,” he said. How about investing that money in helping upgrade the residential/commercial heating systems in Krakow, so the dumb Polacks will stop burning their trash/coal and polluting the air? In an article by the Krakow Post, Krakow was named one of the worst cities in Europe for air pollution, fix the air pollution problem first, then worry about the (edited for inappropriate language) Nowy Huta later. The above comment has been edited for foul language. Commenters who persist in using inappropriate language will be excluded from this forum. You’re an idiot. Go to hell bigot! @tenkris – the truth hurts huh!! Yes, it hurts everyone reading your comments, as you are a complete and total idiot. Go away. Far away. @tenkris – you can’t handle the truth – that you are a loser …. Could we have some civility here, please. This pierogi person should be out of the forum. Truth with vulgarity do not mix. I would opt for restructuring of the infra structure in and around Krakow.